We moved into a new building in the Upper East Side of New York City, and right below me was this pizzeria I never had tried before called Delizia Pizza. I think before I even unpacked the boxes I headed down to try it out. My neighbors told me how delicious the pizza at Delizia was so I anxious went in to try it out. After taking about 30 steps I arrived in the doorway of Delizia Pizza which was extremely clean and cooler than the outside air. The place wasn't too busy so I was able to walk up to the counter without having to wait at all. The guy behind the counter wasn't too friendly and asked me what I wanted with a thick Latin accent. I ordered 1 Sicilian slice which didn't look to appetizing from the display counter and began to wait. 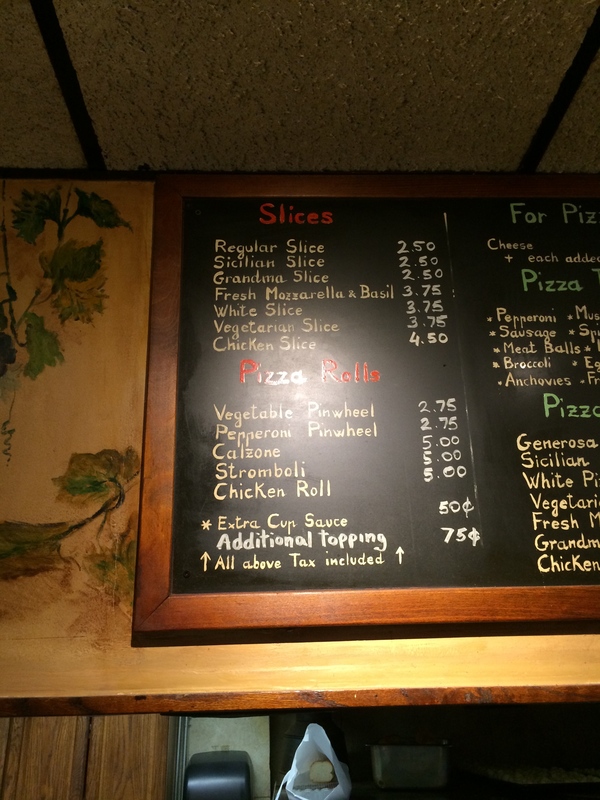 The garlic knots didn't beg me to order them, but I would have enjoyed trying them out if they looked better. Eventually my slice came out and I found a seat near the window so I could do some people watching while tasting this slice. 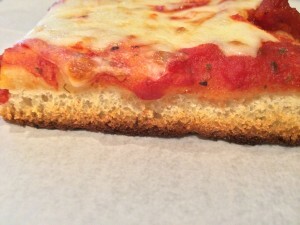 I lifted the slice up and was super impressed with how firm it was. It was a heavy slice but was lacking a lot of cheese. Upon further inspecting the bottom of this slice at Delizia Pizza, I noticed it was actually overcooked and that probably helped it stay so strong. I didn't let a little burnt crust stop me from digging in though. My first bite was ok. It was nothing extraordinary in my opinion. Since this would be the most convenient pizzeria for me to frequent every other day, I thought to myself for a while. Hmmmm, maybe I can take a second bit and it will taste much better since I need to have a good pizza place nearby. So without hesitation, I took a second bite. Unfortunately this pizza was good, and just not great. Maybe I should have tried a regular slice instead? The sauce was probably my favorite part of this slice once I removed the parts that contained the chunks. It was somewhat sweet and tasted fresh. The cheese didn't strike me as an expensive blend, but it was hard to tell with the little amount they applied. The crust (although overcooked) has a nice taste where it wasn't burnt. Anyways, I think pizzerias located in Florida should take note... $2.50 a slice in an extremely high rent district and they manage to survive. You pizza places down to the South must enjoy ripping your patrons off. I will go back soon and try the regular slice and hope it is better. 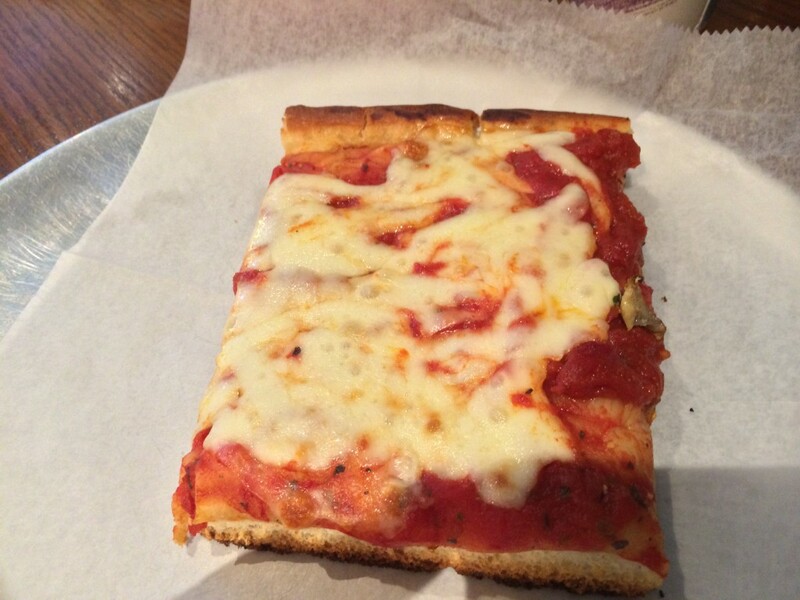 There is a small chance this slice was just overcooked initially and overcooked when they reheated it again, and maybe a fresh Sicilian would taste better. Who knows, but since I am so close I will come to learn I suppose. Delizia Pizza in New York City gets 4 out of 8 slices.